Emil Joseph Kapaun was born near Pilsen, Kansas, in 1916 and was raised on a small farm by Bohemian parents, Eros and Elizabeth. He was the first son born to very devout parents. It was obvious from his earliest years that Emil was being called to a Priestly vocation. He was very blessed to have devout parents who encouraged his vocation. He was fortunate also to have a Parish Priest, Father Sklenar who not only encouraged Emil in his Priestly vocation but also helped him pay his way through seminary during the tough times of the depression. Emil was ordained in 1940 and was sent to assist his pastor at his home parish in Pilsen. As well, he served as the Auxiliary Chaplain at Herington Air Base nearby Pilsen where he was to get his taste for the military chaplaincy. When Father Sklenar retired, Father Emil assumed the pastorship of the Pilsen parish. He quickly grew uneasy about shepherding the souls of his relatives and of so many others that he knew from his childhood. The bishop, who had helped him through the seminary, sympathized, allowing Father Emil to volunteer for a chaplaincy in the Army. The twenty-eight-year-old priest began training for the service at Camp Wheeler, Georgia, in October of 1944. He and one other chaplain had 1900 servicemen and women under their spiritual care. In April 1945, after he completed his chaplaincy training, Emil was posted to India and Burma. Each month Emil would travel almost two thousand miles, offering Mass and hearing confessions in tents or even on the hood of his jeep. Wherever the troops were scattered, he found a way to reach them. Within just a year’s time, the American chaplains with their own money and the support and gifts of the troops were able to build a church and a school for missionary priests and nuns. Emil was promoted to Captain in January of 1946. In May, the campaign in Burma ended and Emil returned to the states with his troops. Emil returned to doing parish work, at St. John Church in Spearville, Kansas. However it was becoming clear that the Korean conflict was going to escalate to a shooting war. The United States made a commitment to the defense of South Korea against the Communist North, and Emil received permission to re-enlist in the Army. There were 80,000 American troops in occupied Japan in 1950, most of these men and women when they enlisted had no idea when they enlisted that they would soon be called to join the Korean conflict that would claim 33,000 of their lives. Emil left with the bulk of the troops for Korea in July of 1950. The Reds in the North were well prepared for their invasion of the South, the United Nations and South Korean forces were often in retreat before them. As the American troops became more organized, they put an end to these losses and moved the offensive northward. If the Chinese Army had not come to the aid of their comrades the conflict would have ended very quickly. Emil served with the 35th Brigade who trained at Fort Bliss, Texas. These men were fierce combatants and always had their place in the front lines. His fellow soldiers recalled later how courageous and charitable Emil was. Offering Mass became a problem for Emil. Often his Mass kit and jeep would be lost to enemy fire. Much of Emil’s time was spent preparing the mortally wounded to meet God. He gave last rites and final Holy Communion to thousands of the dying. On two occasions, bullets came so close to hitting him that they shattered the cigarette he had hanging out of his mouth. Often Emil could be seen taking fruit and water to dehydrated soldiers. In September of 1950, Emil was awarded the Bronze Star Medal for bravery. In less than two months he would be a prisoner of war. About three hundred of the 8th Calvary Regiment crossed the border into the North in pursuit of the enemy. The Communist, however, vastly outnumbered them. They were quickly surrounded and faced either death or surrender. Emil had the highest respect of his men and when he counseled them to surrender they abided by his prudent advice. A two week march took the captured Americans 300 miles deep into North Korea to a place they called “The Valley”. During this grueling march, when the soldiers were allowed to rest, Emil would stay on his frozen feet, walking among them, praying with and encouraging them. The prison camp they were marched to was not fit for animals, let alone humans. The barracks had little or no heat. Temperatures dropped to forty below zero at times and there were no winter clothes or blankets. Several troops froze to death in their sleep. Of the 3000 American soldiers who ended up at this camp from 1950-1951, 1200 died from the cold, starvation, or sickness. Emil knew that food for his men was a top priority. They could not survive on the food supplied by the North Koreans. Emil learned how to move with stealth, like a cat in the dark, make off with whatever provisions he could collect, and bring them back to his starving family. On these excursions all the men would pray to the “Good Thief”, Saint Dismas, for the brave Father’s safe return — if he were caught the punishment could be death. Early in 1951, the prisoners were transferred. The new camp was worse than “The Valley”. Growing weak himself from all his self-sacrificing activity, Emil’s unsteady legs caused him to take a misstep and sprain an ankle. Emil, nonetheless, continued to hobble around in this condition. The sprain was so severe that its abuse soon caused the ankle to become infected. A doctor from the brigade ordered Emil to stay off his feet and rest. His fellow prisoners brought him aspirin, extra food, and heated bricks. Still, the infection grew more inflamed. Diarrhea ensued, and finally pneumonia. The Communist guards had no compassion for prisoners who became ill. They moved Emil to a place in the camp that they called “the hospital”. The fact that no one came out of this hellhole alive earned it another name from the prisoners. They called it “the dying place”. This is where Emil was to spend the last two days of his life — in a dark, dirty room, lying on a mud floor. On May 23, 1951, Father Emil Kapaun’s soul was taken by the angels to meet his Savior. Chaplain Emil J. Kapaun died on May 23, 1951 in Pyoktong, North Korea. His remains were buried in an unmarked grave along the Yalu River. His name is inscribed on the Courts of the Missing at the Honolulu Memorial, the National Memorial Cemetery of the Pacific. 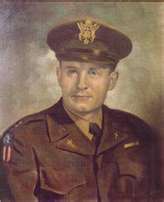 Father Kapaun was awarded the Distinguished Service Cross, Legion of Merit and the Bronze Star Medal with “V” device for valor, the Purple Heart, the Combat Infantryman’s Badge, the Korean Service Medal, the National Defense Medal, the United Nations Service Medal, the Korean Presidential Unit Citation, the Republic of Korea Service Medal and the World War II Victory Medal. The Catholic Church is currently considering Father Emil Kapaun for Sainthood. As well, he has been nominated to receive the Medal of Honor. While not trying to detract from Father Kapaun's military service, I would point out that he was not eligible for the Combat Infantryman’s Badge as he was not qualified as an infantryman. He was classified as a chaplain and served the infantry units he was assigned to as a chaplain. The Combat Infantryman’s Badge is a honor reserved for those soldiers with an infantry specific job code that have actually served in combat under enemy fire. Father Kapaun may have served in comat under enemy fire, however he was not an infantryman, and thus does not qualify for the award. Father Kapaun demonstrated a selflessness that is unique among men and I am proud to call him a fellow Kansan. His service to his fellow man will not be soon forgotten. Agree, with your point. Somewhat. As a infantry man, I would question the author about the alleged honor. If the honor WAS authorized the Dept of Army, then the Army justified and authorized this award. The padre was truly a force multiplier by stablilzing morale and increasing esprit de corps. Too many vets swear to many of his actions and … just let it go. I would allow the padre' spirit to wear his Medal of Honor and CIB!